Which is Better: .260 Remington or 6.5×55 Swedish? Since I wrote those words some time back, I’ve acquired the three small contenders – .260 Rem, 6.5X47L, and most recently the 6.5mm Hornady Creedmoor and started doing load development and comparative tests. All three rifles have match-length barrels (28 or 30-inch 1:8s) — two NZ True-Flites and on the .260, a 30-inch 5R Bartlein. How the barrel is throated is a key issue with this trio. In my case, I have always had the feeling that the .260 Rem and 6.x5x47L are at their best with 120-130 grain bullets and both have been chambered to suit the 123gr Scenar seated optimally. Both shoot this bullet fantastically well at getting on for 3,000 fps using Vihtavuori N150. I’m constantly amazed by this bullet’s external ballistics performance at up to 900 yards. I’ve yet to try it at 1,000. No, you won’t stand up to someone shooting a 7 WSM or .284 Shehane with 180gr Hybrids or VLDs at 900 or 1,000 in rough conditions in an F-Open match, but that applies to the 6.5-284 too. 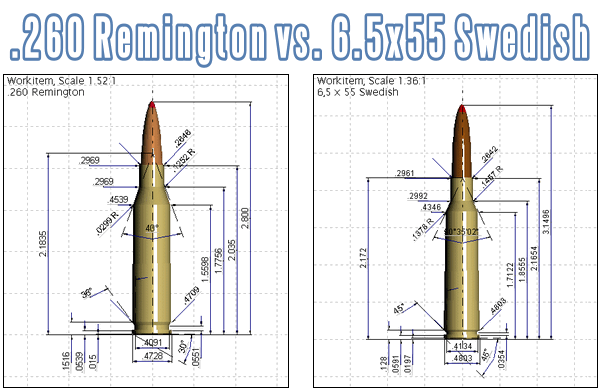 Share the post "Which is Better: .260 Remington or 6.5×55 Swedish?" With only .130(~1/8″) difference in case length, I don’t get how one is for short actions and one is for long actions. I would not use either in short action. I’ve gone the hard journey and shoot a 6.5 x 55 Swede in a SA Rem 700 out of AI magazines. It can be done and you can get good results. There are a few tricks. Firstly, OAL is limited to 123 grain and less projectile weights with the Lapua 123 grainers being the go to bullet. This is due to bearing surface, with most US brands having too short a bearing surface in the heavier weights. The Lapua 139 Scenar will also fit in an AI short action mag. The other trick is a compressed load of slow burning powder. H4350 works a treat. The bolt face needed to be opened slightly with a Sako style extractor. And the barrel is 18 inches – but that is another story. these drawings are not drawn to scale. Why bother writing about relative size? If it’s strickly for Target I’d use the 6.5×55 hands down, turn the rims and single load in a short action, just like my Rem. 40X’s in 30-06 and .300 Win Mag. both short actions! RCBS.Load agrees with the case drawings shown here. IMO, the 260AI being improved and now probable with Lapua cases, large or small primer, is superior to both. We are running an improved version of the swede. Berger bullets’ new 130 grain AR Hybrid Tactical has allowed us to run out of a short action. 2963 fps out of a 20″ barrel 48.5 grains of H4350. 3058 fps out of a 26″ barrel 46.5 grains of H4350. This was a dream of ours for years, and Berger made it happen.